In 1810, W Moore and Son advertised Nathaniel Chandler’s house for sale by auction. It was described as a ‘very substantial brick-built front dwelling house immediately opposite the Town Hall’. There was a little hyperbole in this description. 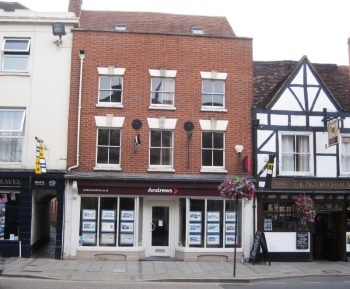 The building, 128 High Street, is that now occupied by Andrews Estate Agents, and if you look carefully through the upper windows you will recognise a common feature of the eighteenth century town. A nice, symmetrical Georgian brick front has been put onto what is still essentially a grand timber-framed, and hence old-fashioned, building. The advertisement describes the rooms and facilities. It was well provided. Behind the house was a yard with kitchen and brew-house. The house had its own spring, and a 3,000 gallon reservoir. Best of all, though, was that the house came with the right to vote for Members of Parliament for both Tewkesbury and Gloucestershire. There was a garden and a ‘right of road’ into the Oldbury Field. The sale, in lots, included six well-finished tenements, built in brick, behind the dwelling house. This was a plot on the High Street, extending to the Oldbury, which though it may once have had a court entrance from the High Street this had long been closed up and the entrance to the cottages at the back was from the Oldbury, using the adjacent Old Post Office Alley to get there. The six houses formed the Bleach Yard, so named because stockings (Nathaniel Chandler was a hosier) were laid in the sun to be bleached, to whiten them from the natural brown colour before sale. In 1853, five of the cottages were sold at auction and stayed in common ownership for the remainder of their existence. 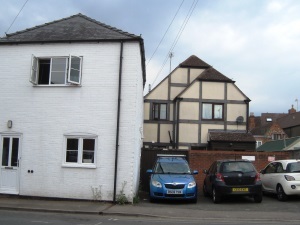 In 1875, Thomas Walker, who had established himself as an engineer in Tewkesbury, purchased a warehouse and yard behind Walls Court and five adjacent cottages in the Bleach Yard. He paid £460, to Charles Bolton Edgecumbe of Hanley Castle. The warehouse became his workshops. One of the houses became a warehouse and the others were rented to his workers. Seven years later he bought the disused building at the rear of the Wheatsheaf, once a theatre and latterly a silk-throwing mill, and branched out into manufacturing fairground rides. The cottages returned to residential use until the fire in September 1908 burned down the old silk mill, and almost destroyed the business. The Bleach Yard, with other properties in town, was pressed into use for manufacturing until a new factory was opened in 1912 in spring Gardens. One of Walker’s long-term employees, who lived in a Bleach Yard cottage, was Jack Pennell, who specialised in agricultural machine repairs. His uncle John Pennell was once the landlord of the Cross Keys in Bredon’s Hardwick, but before that led a ‘boy’s own adventures’ life. Among his adventures, he was one of the small team who went with David Livingston’s expedition of 1858-64, up the Zambezi on the ‘Lady Nyassa’. He was the stoker, seconded from the Royal Navy. (It was much later, in 1871, that Stanley and Livingston famously met). Just before his death in 1912, Thomas Walker transferred his property to his wife and they remained in Walker ownership until their demolition. Along with many other Alleys in Tewkesbury, the beginning of the end was in 1938, when the Borough’s first proposals for clearance were made. In September it was numbers 1-5 and in October Number 6 was added to the long list. By February 1939 the draft order for clearance had been prepared for consultation. Five cottages, a washhouse and two toilets. The Ministry held an inquiry in May 1939, where Mrs A Walker, the owner, objected on the grounds that her houses were in sound condition and her only source of income. The Medical Officer of Health disagreed. He said that the housing density was too great, the structural conditions were poor, they were damp, badly ventilated and poorly laid out. The order was confirmed in August and the houses were demolished. They were replaced with small commercial and industrial units occupying the whole area of Thomas Walker’s original purchase in 1875, and the court, or yard, disappeared from the map. When the engineering company based there moved to more convenient premises on the industrial estate, the area returned to housing use, but not a new Bleach Yard. The seven houses built along the court in 1991/2 faced the other way and are entered from Old Post Office Alley; another contravention of the old rule that cottages enter the alley behind their front house. The houses, though, fit very nicely into the alley so this break with convention can be forgiven.